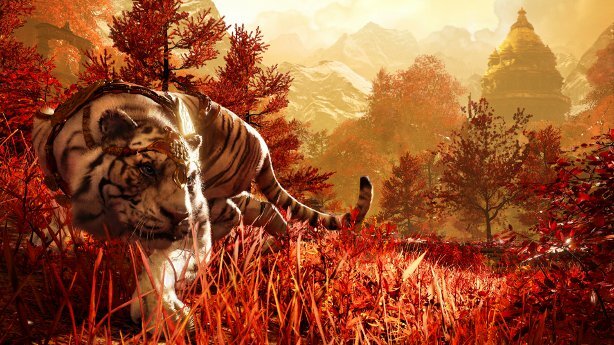 Far Cry 4 is about a man returning home to scatter his mother's final earthly form. Only he gets distracted, goes mountain climbing for a bit, helps dismantle a despotic regime, fights a tiger, runs in circles looking for an ancient scroll, lands a gyrocopter on someone's house and develops a caustic vendetta against nature's sweet-sounding fur demon, the honey badger. This doesn't make him an absent-minded son so much as the protagonist in an excellent open-world game. Like the vessel enshrining his mother's ashes, Ajay Ghale can't accomplish anything without a player to move him, lugging him up and down South Asian mountains in pursuit of peril and the next exotic vista. And like Ghale, you get in so deep after a while that it doesn't really matter what brought you there in the first place. Your arrival in Kyrat, a tumultuous kingdom forever watched by the Himalayan mountains, is colored by a brutal encounter with a Chinese national dressed in fine purple and topped with bleached hair. Pagan Min, an eloquent and showy psychopath, sits on the country's throne as an outsider who wiggled in at the last minute, and as someone who wants to keep thrones a thing for as long as it's comfortable. Min's mock monarchy is characterized by torture and insular propaganda. His face is on the money. In one outburst that puts him firmly in the "eccentric villain" category, he decides to ban candles because they're just so ubiquitous. Though Min is more often a funny, taunting voice than an immediate threat in Far Cry 4, he functions like a smug North Star guiding your actions and those of The Golden Path, a spirited rebellion with ties to Ghale's father. Joining is mandatory, but how and when you help them kick out the king is up to Far Cry's rhythms of violence and exploration. When you're not out and about for fun, though, you're helping the Golden Path to sabotage and destroy various components of Min's dominion. This also means picking sides and mission goals between the Path's two horn-locked leaders, Sabal and Amita. The venom between these two as they plot a well-meaning future for Kyrat is really the most interesting part of Far Cry 4's story. Sabal wants to preserve the country's cultural foundation and burn all corrupt elements, while Amita has an eye for funding the war and demolishing traditions that treat women unfairly. Both are convincing (with great performances), and just when you've made up your mind with one, the other will chew you out and re-frame the most recent outcome in a disturbing manner. The only problem is their dependence on you makes the war seem static, lurching forward only when you decide to show up. Such is narrative trying to survive in an open world. The dense, snow-crowned world of Far Cry 4 has you bobbing up and down across waves of grass and spruce trees, but it isn't until you climb that you get a sense of how high and how deep this place goes. The rules and construction underpinning the behavior of Kyrat sometimes fade from mind completely, leaving you simply as someone startled to crest a hill and find a peaceful parade of yaks – soon disrupted by an angry bear. Wind whips banners and flecks of snow without end, always keeping the temples and villages awake. It almost makes you wish for more Kyrati professions beside freedom fighter. A photographer capturing animals through a lens – not just using a camera to mark targets patrolling one of Min's many outposts – would be novel. How about using that new grappling hook as a professional spelunker? I spent a lot of time swinging across cliffs and through silent moonlight, just enjoying the isolation and satisfying clang of the climbing hook latching on. Combat soon follows in a country at war with itself, though, no matter how beautiful it is. It's a strong and exciting counterpart to exploring Kyrat, and necessary in helping the Golden Path take it back. You'll assault Min's soldiers ('Minions' is already taken) to reclaim dilapidated bell towers, now broadcasting propaganda, as well as military outposts, which will then open up as places for you to purchase weapons and supplies. Having a nearby outpost under The Golden Path can also save you a lot of backtracking should you die – though Far Cry 4 also saves near dangerous points of interest, for the most part. The weapons and vehicles in Far Cry 4 have a thrilling crunch to them, but the game's largest improvement is in what ultimately constitutes a weapon or vehicle. Elephants, for example, are tanks, whether you let them rampage on their own or ride them. Bengal tigers are shotguns, provided you have some bait to toss in the middle of a camp. And hawks, I've decided, are both weapons and vehicles, because they tend to attack me while I'm trying to snipe and then fly off. It's basically a drive-by shooting. 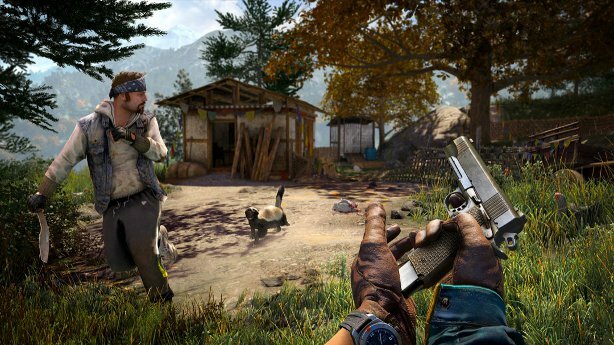 There's a chance someone may even witness your crazy circumstances for a change, thanks to Far Cry 4's online co-op, which now takes place in the main campaign instead of being cordoned off in special missions. Claiming an outpost is a different experience when someone has your back: Getting detected is more like an opportunity to let loose, and being down to your last quick-heal syringe isn't quite as stressful. A stable connection (and stable servers) are a must, mind you, because it's a quick trip out of Kyrat and back to the main menu if something goes wrong. In my experience, everything ran just fine. As organic as many of Far Cry's systems are when they clash against you and one another, the game still insists on grafting a progression system to its beautiful, you-are-there world. It's inoffensive, and you can disable HEADSHOT ETC XP notifications entirely, but a jarring step away from the game's naturalistic presentation. The crafting and hunting system makes more sense, with downed animals lending themselves to more holsters and bags and, thus, greater possibilities in combat. Far Cry 4's other faults lie in some of the orchestrated missions, i.e. the few instances where freedom is reduced. Some of these missions are just bad at communicating goals or suggesting that failure is needed to advance. One particularly puzzling mission even ends with you dying, in the same way you do any other time, but in that instance it's an acknowledged part of the story, not just swept under the rug for a do-over like it always is. What's even more disappointing is what else Far Cry 4 brings back to life in its campaign: yet another exotic temptress and Far Cry 3's juvenile whoa-dude approach to drugs. Far Cry 4 also resurrects map creation and competitive multiplayer in a modest but smart spin on the prominent themes of the campaign. The maps stick to wide-open terrain and split a couple of objective modes between The Golden Path and The Rhakshasa. The rebels have access to powerful guns and vehicles, while Pagan Min's elite Rhakshasa group uses only bows, animals and strength-enhancing herbs plucked during the match. It's a bit like the Ewoks versus the stormtroopers in Return of the Jedi, except the Ewoks can summon legitimately scary bears. There's one more twist in Far Cry 4: By finding and gazing at ancient paintings (thangkas), you can enter Shangri-La, here depicted as an ailing utopia corrupted by demons. You relive the life of Kalinag, a Hindu warrior, across a handful of missions that gradually escalate – much like the main campaign – from stealth into open aggression. The unique religious inspiration and bright otherworldliness of Shangri-La makes it a worthy sidequest, especially with a spectral tiger as ally. There's a staggering number of adventures to extract from Far Cry 4, whether you chase the ones laid out by the game explicitly, or the ones that develop naturally as you take in the sights. It's another interesting and absorbing world to fall into, shoot through, burn and then guide to new beginnings. Far Cry 4 may have installed a despot, but it's still the undisputed king of the open-world shooter. 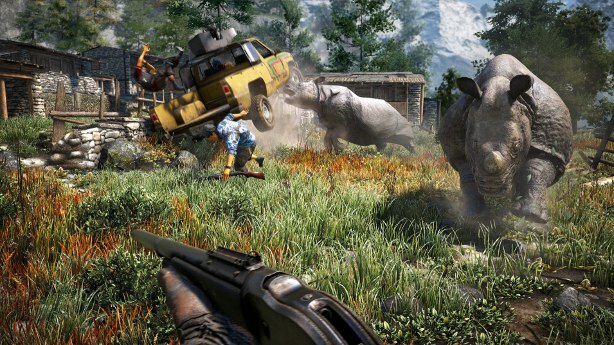 This review is based on reviewable code of the PS4 version of Far Cry 4, provided by Ubisoft. Images: Ubisoft.